Which Knot Is For You? - Spiffo! Home / Products / Product Info / Which Knot Is For You? Shaving brush knots are one of those things that are often seen as shrouded in mystery. What is a Silvertip? What is a Best? Should I choose a Badger? A synthetic? A boar? A horse?! And what is the difference?! This mystery has been further purported by false claims, promotional hyperbole and misunderstanding. Because it comes from the neck and muzzle area of the badger, High Mountain White is the rarest and highest grade of badger hair. It has the softest and most luxurious natural tips and usually the most defined colour contrast with its distinct black band and white creamy tip. The hair is generally finer resulting in a denser knot that can hold more water, while remaining extremely soft. This allows it to easily produce a rich and dense lather, resulting in a superb shave. High Mountain White is the standard against which all other badger hair is measured! Silvertip Badger knots are synonymous with high-quality shave gear! Very similar to the High Mountain White knot they are soft and luxurious and have the same characteristic colour contrast of a black band and white creamy tip. A top quality knot that easily produces a rich and dense lather, resulting in a superb shave. Similar in looks to the Silvertip the hair for the Super Badger knot is normally plucked from the back of the badger. These are then graded and sorted to such a degree that its performance is superior to that of Best Badger. They feature soft bristles and natural tips with a strong backbone and a good ability to absorb water. Many people feel that after a break in period they are close in performance to Silvertip! Best Badger knots are made with the finer and more pliable hairs from the back of the badger’s body. The hair is light to dark in colour with no distinct black/white band appearance. It is more densely filled with hair than the Pure Badger brush and will produce a correspondingly greater lather. The natural tips are softer than Pure Badger, making it the best value in terms of softness for your dollar! A Pure Badger knot generally contains hair from the underbelly of a badger. This hair varies in softness, pliability and color, which is usually dark tan to black. Its longer shafts make it coarser than other badger hair. Likewise, Pure Badger knots are most often trimmed to shape, resulting in somewhat stiffer, rougher ends. 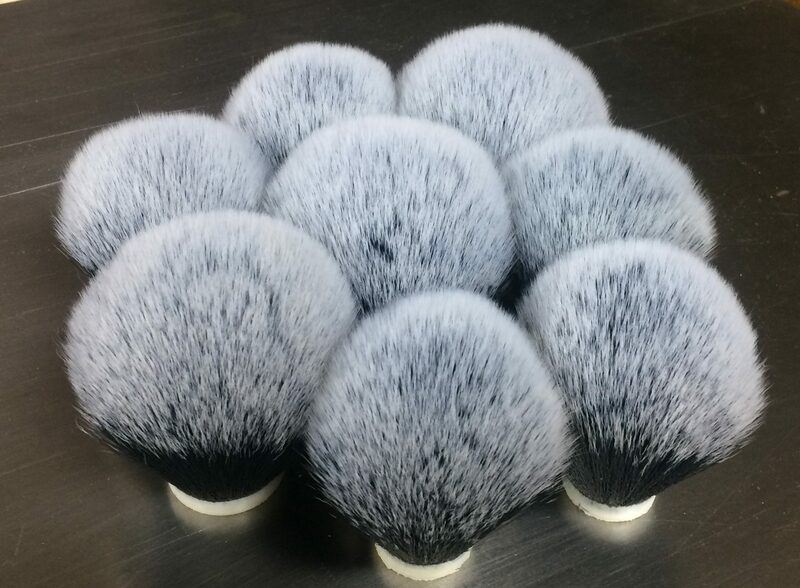 Because of its low cost Pure Badger brushes are suitable for the beginning shaver who wants to learn the intricacies and nuances of wet shaving before moving on to a higher quality and more expensive brush. The bristle from Boar is stronger, thicker and less flexible than Badger and at first, very coarse. The coarser texture and stronger backbone makes it very useful for lathering soaps well. Over time, the natural, unclipped ends of the bristles will split into two or three individual tips connected to the same thick shaft. Known as “breaking in”, this will greatly soften the knot and make for a more enjoyable shave. Colours range from yellow to white, often with a dyed black imitation band. Boar bristle tends to dry quicker than Badger and therefore makes a great travel brush too! Harvested from the tail and mane of the horse, Horsehair is often described as being between badger and boar; soft like Badger but with a stiffness similar to Boar. It is good for both bowl and palm lathering. The Tuxedo is the first ever black and white shaving knot! The knot is named not only after its black and white appearance, but because it gives a truly luxurious experience to your shaving routine. The performance of this knot has the ease of lathering of the common “Plisson” style synthetic with some unique differences. It is believed that this knot has a similar feel to the “Game Changer” knot with similar tips to that of the “Uber Soft” knot. It seems to be almost a hybrid between the two. With the same great look of the Tuxedo but with a stronger backbone the Luxedo is a true dream to shave with! The feel of the stronger backbone is similar to a Badger Two-Bander making it a perfect choice for both face and bowl latherers. This black and white synthetic knot is very, very similar to the Tuxedo and offers the same top-class quality and shaving experience. Truly an outstanding knot with the high quality that you expect! It feels so soft and luxurious and easily creates a billowing lather. A popular choice! The appearance of this knot reminds one of the natural look of a horse hair knot and therefore is often referred to as “faux horse”. We know that there’s nothing fake about the quality, the feel or it’s lather making ability so we prefer to call it Equine-Synth! The knot has hair that feels slightly thicker than that of the Tuxedo. Its extra density as well as its thicker hair provides it with a good amount of backbone for face latherers. A beautiful knot in both looks and use! The Cashmere is one of THE softest knots we have ever felt to date! The hair in this knot is super thin, providing you with one of the softest knots you’ll ever feel on your face. However, the extra density of the knot provides you with that backbone needed to provide a creamy lather. The thin hair and extra density pair perfectly in this knot to give you a fantastic shaving experience! The tips are on par with the Cashmere knot and the backbone is a bit less than that of the Tuxedo which gives it the best splay of any synthetic knot. Plus it looks great! Smokey in appearance, this knot gives an interesting performance. It can be described as a hybrid between the backbone of the Tuxedo, with the face feel of the Cashmere when using a light touch. The creamy white bristles of the SilverSynth Synthetic knots with their badger-like black band not only look great but are soft with a bit less backbone than the Luxedo and a bit more than the Black Tie or Tuxedo.